Pick over the lentils and remove any stones or shriveled lentils. Rinse the lentils in a fine-mesh strainer and drain well. Add the onion and green pepper to the pot and sauté for 3 to 5 minutes or until the vegetables begin to soften. Hit Cancel. Add the broth to the pot and scrape up any brown bits. Stir in the tomato paste. Add the lentils, crushed tomatoes, diced tomatoes and their juices, bay leaf, Italian seasoning, garlic powder, and brown sugar. Stir well. Close and lock the lid. Turn the pressure valve to sealing. When the cooking is complete, hit Cancel. Allow the pressure to release naturally. If the sauce is too thin for your liking, you can either use an immersion blender to blend it to the desired consistency or turn the pot back to Sauté/Less and cook for 5 to 10 minutes, stirring occasionally until the sauce thickens. Ingredient tip: Lentils come in many different varieties. Red lentils tend to be more delicate than green or brown ones, and they pretty much disintegrate when cooked. This makes them perfect for thickening sauces, soups, and stews. 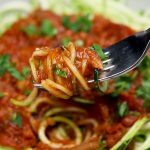 Serving suggestions: Try this marinara sauce on top of spaghetti squash or zucchini noodles. You can also use it as the pasta sauce in Acorn Squash Stuffed with Pasta and Turkey Italian Sausage or as a topping for Cauliflower Pizza Crust.